ÉlégantEve: What is Jojoba Oil? And what are it's benefits? 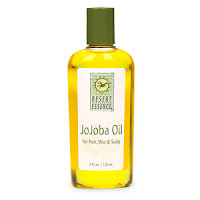 What is Jojoba Oil? And what are it's benefits? My little girl has very frizzy hair, and using just conditioner doesn't help much with the frizz. Until I discovered Jojoba oil. It is amazing. I would mix it in with her conditioner (Suave kids) and leave it in her hair for 2-3 minutes and rinse it off. And would add just two drops to her hair while it is still damp, It leaves her hair smooth and less frizzy for few days after the use. 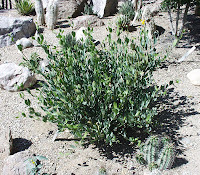 Jojoba oil is not really an oil, but a liquid wax that comes from the plant jojoba plant. 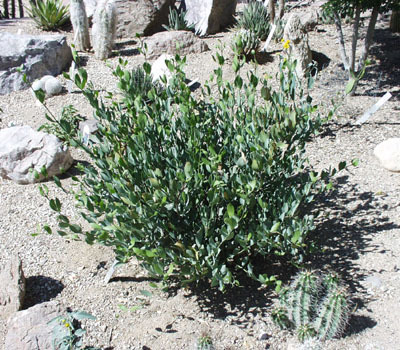 This plant is found in the southern Arizona, southern California, and northwestern area of Mexico. Jojoba oil is compatible with the skin because the wax in the plant is known to be very close to the oil in the human skin oil. Eye and face makeup remover. Add a few drops to a cotton ball, and wipe over the eyes and face. It removes all the makeup and does not irritate the skin. I have oily skin, so I can't use it alone as a moisturizer, so I add few drops to my facial cleanser, and wash my face. This works both ways as a cleanser and moisturizer. You could also use it during the night as moisturizer by adding few drops to your face and neck. Body Moisturizer. Apply to the body after a shower, while the skin is still damp, this helps locking the moisture leaving the skin feeling soft and smooth. Deep conditioning treatment for hair. Add the oil to your hair, and cover with a plastic shower cap, and leave in for 1-2 hours, then wash and condition normally. You can also rub one or two drops while the hair is damp to help with split ends. Lip conditioner. Apply with fingers to the lips at night, it is a great over night treatment for the lips. Cuticle oil. Use at least once a day on hands and cuticles. Shaving prep, and after shave. Rub oil to the body before you add the shaving cream, this helps prevents razor burns, and leaves the skin smooth. Or you can apply it after shaving to smooth and moisturize the skin.